Hippocrates said that our food is our medicine, and our medicine is our food. Nothing illustrates this more than the probiotic food kefir. I feel like I’m running a compounding pharmacy every time I make it. Kefir is made using “grains” to ferment any milk (goat, cow, coconut, etc. ), incorporating their beneficial organisms to create the cultured product. The grains look like clumps of cauliflower but are clusters of healthy yeasts and bacteria. Kefir is pronounced Ke-Feer, according to the dictionary. It is more commonly pronounced Kee’ fir. At our house, we call it Keff ‘ it. When it comes to pronunciation, anything goes. Kefir means “feel good” in Turkish. It is a complete protein and is high in minerals and vitamins, especially the B vitamins. 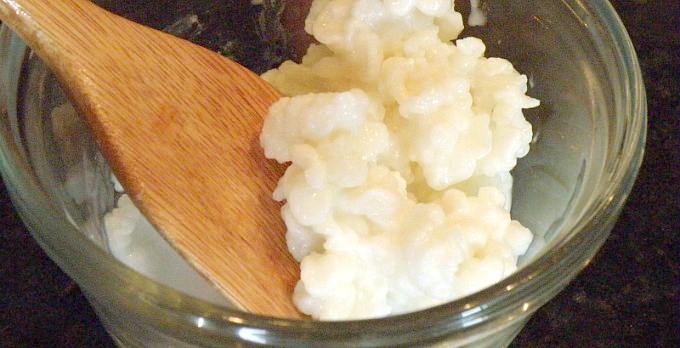 Homemade kefir contains up to 35 strains of good bacteria and yeast (as opposed to yogurt, which contains a handful). Bottled kefir purchased at the store may contain up to 10 strains but often includes unwanted additives. Kefir, therefore, is best when it’s homemade. Because of kefir’s ability to establish healthy bowel flora, it is beneficial in preventing many gastrointestinal disorders. Some researchers have found that kefir also exudes bacterial inhibitory factors, which prevent the growth of harmful bacteria. In this sense, it acts as a natural antibiotic. Some studies show that kefir whey neutralizes most pathogenic bacteria within 24 hours. This study indicated that kefir protects colonic crypt cells against radiation-induced apoptosis, which was most pronounced in the stem cell region of the crypt. The antiapoptotic effect of fermented milk kefir was due to the inhibition of caspase-3 activation. Dairy kefir also contains tryptophan, one of the essential amino acids known for its calming effect on the nervous system. The tryptophan in kefir, in combination with its calcium and magnesium, makes for a soothing and relaxing drink. Dominic Anfiteatro, an Australian native, has been studying kefir and its health benefits for years. He considers kefir to be a “probiotic gem” cultured with a “probiotic jewel” (kefir grains). His kefir expertise is unparalleled. His website can be viewed here. Once the grains have been procured, kefir is easy to make. See How to Make Dairy Kefir for specific directions.